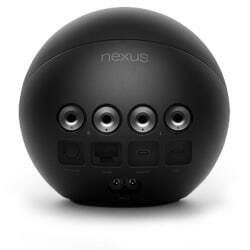 The Google Nexus Q is a media player that runs Android 4.0 and is controlled via an Android phone or tablet. The Nexus Q, described by the search giant as “the first-ever social streaming device”, was launched at the end of July 2012 at Google’s I/O developer conference. The device runs Android 4.0 and includes a 25 watt amplifier as well as NFC, Wifi and Bluetooth connectivity. It is designed to be plugged into hi-fi speakers and a TV in the home and connect to multiple Android phones and tablets, which act as remote controls and content sources for the player. A teardown of the device conducted by iFixit reveals it contains an NXP PN544 NFC controller. The Nexus Q is available for US customers to pre-order today at US$299 for delivery in mid-July, with other territories promised the media player later.